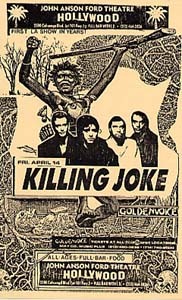 This time has become known as the 'mid-period' of the band -- at least according to most 'encyclopedia of rock' books that even bother to mention Killing Joke's existence. Certainly it was with the Night Time and Brighter Than A Thousand Suns albums that they achieved their greatest commercial (and grudging critical) success. It also marked a time when creative and personal differences begin to come to the surface, setting the stage for some radical changes as the decade came to a close. The first part of the year is relatively quiet in terms of live appearances and activities, presumably because the band are busy recording the Fire Dances album. 26 June: Poitiers (France), Chapiteau Festival "L'oreille est hardie". 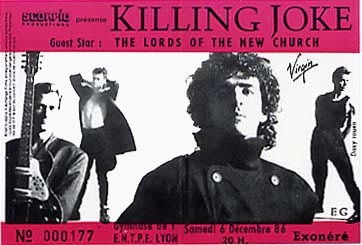 This was the first ever French gig, kicking off at 5:00 PM with an early incarnation of Sonic Youth as the support act along with a now long-forgotten band known as Orchestre Rouge. Setlist: Wardance/ We Have Joy/ Frenzy/ Psyche/ Sun Goes Down/ Lust Almighty/ Song and Dance/ The Gathering/ Rejuvenation/ (Let's All Go) To The Fire Dances/ The Pandys Are Coming. with support from The Box, Sexbeat and Play Dead. Setlist: included The Hum, Let's All Go. with support from Crown Of Thorns. The band perform Dominator, Frenzy and Eighties. A clear but somewhat distant-sounding audience recording was made and widely circulated. There is a tape of this gig, fairly good sounding audience recording. This is the last live appearance for the summer. The band spend August and September recording the Night Time album at Hansa Studios in Berlin. The band also make an appearance on the Estoc de Pop Spanish TV show around this time; the exact date and content is unknown. At some point during this tour, Dave Kovecevic joins on keyboards. Setlist: includes Night Time, Kings & Queens and Darkness Before Dawn. 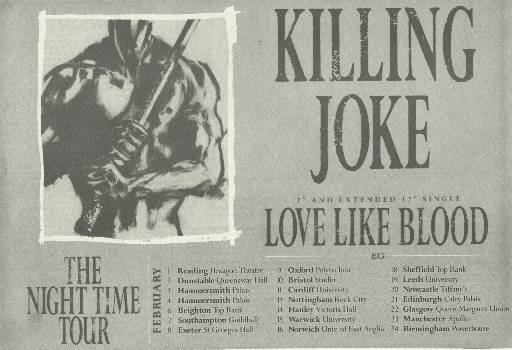 The band perform Night Time, Kings & Queens and Love Like Blood. Setlist: Booids/ Night Time/ Sun Goes Down/ Tabazan/ The Wait/ Darkness Before Dawn/ Kings And Queens/ Multitudes/ Requiem/ Bloodsport/ Love Like Blood/ Tension/ Change/ Psyche/ Eighties/ Wardance. Setlist: Booids/Night Time/ Sun Goes Down/ Tabazan/ The Wait/ Darkness Before Dawn/ Kings And Queens/ Multitudes/ Requiem/ Bloodsport/ Love Like Blood/ Tension/ Change/ Pssyche/ Eighties/ Follow The Leader/ Wardance. Setlist: Night Time/ Sun Goes Down/ Tabazan/ The Wait/ Love Like Blood/ Tension/ Change/ Pssyche/ Eighties/ Wardance. The audio and Quicktime video are available on the official release No Way Out But Forward Go. At least part of the gig was broadcast on German TV and video clips are in circulation. The first part of the year sees the band taking a well-deserved break from touring. They meet up in Berlin at Hansa Studios in the spring to begin work on what will become the Brighter Than A Thousand Suns album. 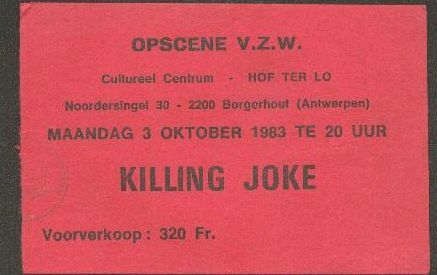 "Killing Joke came over very forceful and Jaz, looking mad as ever, really wanted to give a great set over to those that had braved the rain but it didn't seem to come off. This could be sensed by the band as they did not come out for an encore." --A review from the House Of Dolls magazine, Sept/Oct 1986. Setlist: Twilight Of The Mortal/ Chessboards/ Kings And Queens/ Darkness Before Dawn/ Night Time/ Love Like Blood/ Love Of The Masses/ Sun Goes Down/ Requiem/ The Wait/ Wardance/ Eighties/ Rubicon. Encore: Complications. Setlist: Twilight Of The Mortal/ Chessboards/ Kings And Queens/ Darkness Before Dawn/ Night Time/ Love Like Blood/ Love Of The Masses/ Sun Goes Down/ Requiem/ The Wait/ Wardance/ Eighties/ Rubicon. This concert was also broadcast on Italian TV. At some point during this year, work was begun on the follow-up to Brighter Than A Thousand Suns. 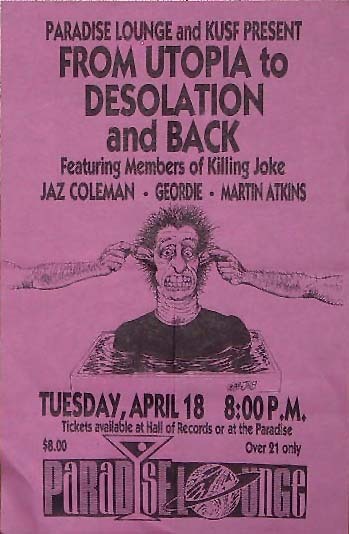 However, friction within the band led to the departures of Paul Ferguson and Paul Raven, leaving Jaz and Geordie to carry on with what eventually became Outside The Gate. Jaz makes an effort to explain the ideas behind the musical arrangements on the album with a lecture, held 19 September 1987, at the Courtauld Institute in London. This lecture was recorded and also released as a Killing Joke album, The Courtauld Talks.